As a young squirt in fourth grade I was the favored victor in nearly all of Hampshire Elementary’s field day events in the spring of ‘93. At least that’s what I had set up in my mind. In playground games during recess I was usually one of the fastest, certainly one of the most agile, and at least 75% most passionate to win. I was much like a cheetah in those days, combining my early growth spurt that gave me long legs with the spirit of the animal I adored as 10 year old. In or around the time of my elementary school days, I remember that they had one of those interactive displays at the science museum in Chicago where you could race a host of animals and famous fast things in a sprinting test down a medium-sized corridor. You lined up at the start line, chose your animal/athlete/machine from the computer screen, and raced down the hallway while the image of your competitor ran beside you on the projection wall. The only thing you really had to do was slow down before you smacked into the wall, but they had already thought that through and put up a few wall pads for other equally zealous ten year-olds. I was enamored with the idea that I could finally race a cheetah. So I tied my Reebok trainers up a little tighter, did some preliminary calisthenics, and readied myself up to the start line. I looked down and saw that I had 1/8 of my foot over the proposed line, so I inched it a bit backwards so that it was flush with the line. I wasn’t going to have my victory tainted by any recalls from the judges or sneaky tv monitors that would belch out instant reply after the race. 3 . . . 2 . . . 1 – the sound and the fury of the start line buzzer! I sprinted down that hall like it was my destiny. 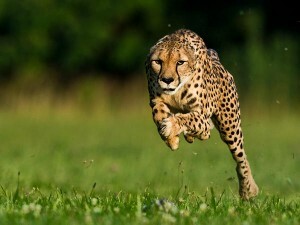 And the cheetah, well, he was more like a rocket. I saw him ahead of me and then cover the gap by at least 15 yards. My defeat was quick and mostly painless. I had not a moment to dwell on my because my brother quickly figured out how the interactive design worked. Apparently, it was controlled by separate lasers at the start and the finish line. So with one of us poised at the start line, and the other at the finish line, we waited for the official countdown and sprinted through the start, and not only beat Carl Lewis, the famed sprinter of the 80’s, but we accomplished what no human was even known to do, we beat the cheetah. I entered field day with the spirit of the cheetah, knowing that since I had beaten the cheetah, I could defeat every competitor who dared race me, maybe even Carl Lewis, but I still had some sense in me and focused on my adolescent peers. I swept the 50, 100, and 200 yard dash. I may have also won the 400 yard dash, or lost it, or we may not have even had it, I can’t remember. I do know there were physical limits to my bravado. I found it difficult to believe that the International Olympics committee could eliminate an event that I was so good at, that seemed right up there with the others of the decathlon. 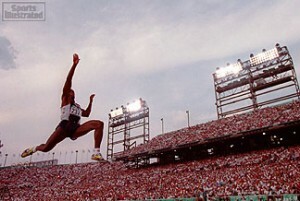 How could Carl Lewis, master of the long jump, the man who could fly like an eagle, not be able to participate in the standing broad jump. He would have gotten a gold for that too. These two tests of athleticism that got me thinking recently about the nature of a gap. Or the goal that stands way out there when you see it from the line of where you currently reside. I see the amount of effort I want to exert, much like the nature of the standing broad jump: look at where I want to go, squat down and then hurl myself forward. 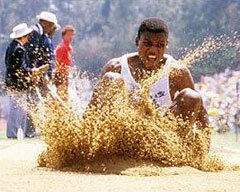 But then I look at the distance Carl Lewis could travel with momentum – 29–1¼ feet – was his record in 1991. It’s all about momentum, a building up of the velocity required to do anything. When I make rash pronouncements of what I want to do, and then lurch forward, I don’t go very far, but when I consistently work on something that I want, I know that I’m building up momentum. When the gap comes, I go faster, and then, and only then it’s time for liftoff. This entry was posted in momentum on March 24, 2014 by Aaron.